It wasn’t an accident that Tracy Coenen became a forensic accountant. She always had an interest in the criminal justice system, with an eye toward becoming a prison warden. While attending Marquette University, a specialty class in the criminology program called Financial Crime Investigation was enough to hook Tracy. She worked as a financial statement auditor at the “Big Six” firm Arthur Andersen before moving to a small forensic accounting firm to learn the art of fraud investigations. 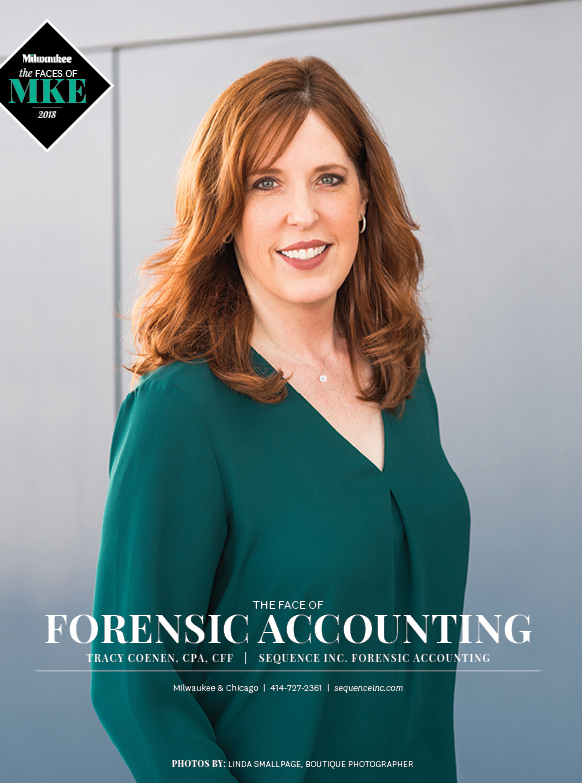 Tracy stepped out on her own more than 18 years ago to start Sequence Inc., where she works exclusively in the area of forensic accounting. Being a solo practitioner limits the number of cases Tracy can take on, but she loves the flexibility it provides. She gets to work personally with each of her clients to ensure a quality work product. When finding lost or hidden money, Tracy is skilled at presenting the numbers in a very understandable way. The movement of money in fraud cases can be confusing, and her ability to tell a story and draw a picture is invaluable. Whether it’s a divorce, a business deal gone bad, or a case of corporate fraud or embezzlement, Tracy can make sense of complicated financial situations and figure out exactly where the money went.